Dave Seamer Entertainments has over 35 years experience in the entertainments industry. We offer a reliable and professional service with everything you will need for your event at an affordable price. Whether you are having a party at home or are planning your perfect wedding day we are here to help. We have everything from a silent disco for 25 people, to a full disco with an experienced professional DJ. Hire our new digital karaoke sytem for a modern karaoke experience. The system includes a karaoke laptop complete with over 2000 songs, song listings, 1 bluetooth speaker, 2 wireless microphones, TV & stand. Hire this system for £120 per night. Hire a funfetti shot for the added WOW factor at your event. 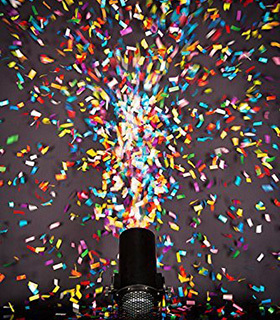 Funfetti Shot is a professional confetti launcher perfect for concerts, parties, weddings and more. You can use multi, mirror or UV funfetti - all available to buy with the hire of a machine. Covering the following areas Oxford, Oxfordshire, Abingdon, Didcot, Wallingford, Benson, Wantage, Cholsey, Goring, Reading, Berkshire, Henley-on-Thames, Newbury, Swindon, Wiltshire, Wheatley, Thame, Aylesbury, Buckinghamshire, Kidlington, Eynsham, Witney, Carterton, Bicester, Banbury, High Wycombe.